Jose Canseco is really hyped up about the 2017 Baseball Hall of Fame class. Unafraid to speak his mind on social media, the former major leaguer and admitted steroid user took to twitter after the 2017 Hall of Fame class was announced. Tim Raines, Jeff Bagwell, and Ivan Rodriguez received election but Canseco was upset with the Baseball Writers’ Association of America for not electing more players suspected of steroid use, namely, Roger Clemens, Barry Bonds and former teammate Mark McGwire. 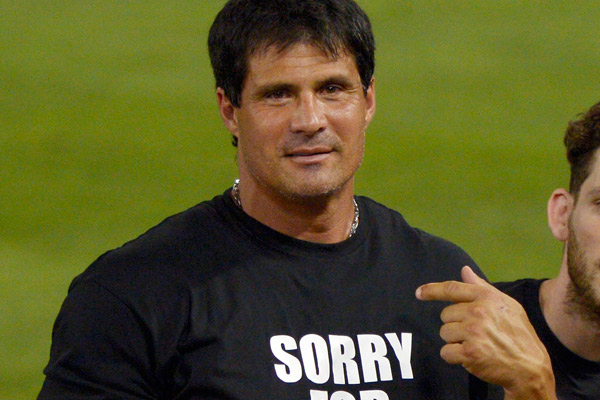 Canseco admitted to using steroids in his 2005 book “Juiced” and has now called out Sports Illustrated writer Tom Verducci for being an “idiot” and thinking Bagwell didn’t use performance enhancing drugs. There has been lots of speculation linking Bagwell to PED’s, but the Astros legend denies ever using them and has never tested positive. This year Jeff Bagwell received 86.2 percent of the vote.